THIS ONE’S FOR THE GIRLS, a new musical by Dorothy Marcic, is set to open Off-Broadway tomorrow evening (Friday) at 8 pm. Performances began October 7th at St. Luke’s Theatre in the heart of the Theatre District. Under the direction of Tamara Kangas Erickson, THIS ONE’S FOR THE GIRLS stars Traci Bair (CIRQUE DREAMS, PANDORA’S BOX), Aneesa Folds (RAGTIME, SISTAS), Jana Robbins (Broadway’s GYPSY, THE TALE OF THE ALLERGIST’S WIFE, CRIMES OF THE HEART), and Haley Swindal (Broadway’s JEKYLL & HYDE, THE SECRET GARDEN at Lincoln Center), with music direction by Zachary Ryan. THIS ONE’S FOR THE GIRLS isn’t just for the girls! This “rocking, soulful and non-stop brilliant” new musical (Stage Scene LA) looks at the role of women over the past 100+ years through iconic popular song hits. From the sad laments of fragile female victims (“A Bird in a Gilded Cage”) to the angry anthems of women who are mad as hell and not going to take it anymore (“I Am Woman” and “You Don’t Own Me”), THIS ONE’S FOR THE GIRLS is a high-energy celebration of American women that’s certain to thrill men, women and everything in between! Writer Dorothy Marcic also created the hit musical SISTAS, the longest-running African American musical in New York history, now in its sixth smash year. Her first musical RESPECT (the genesis for THIS ONE’S FOR THE GIRLS) played in over 70 U.S. cities. Dr. Marcic is a professor at Columbia University, a former Fulbright Scholar and author of 14 books including MANAGING WITH THE WISDOM OF LOVE, RESPECT: WOMEN AND POPULAR MUSIC and, most recently, LOVE LIFT ME HIGHER. 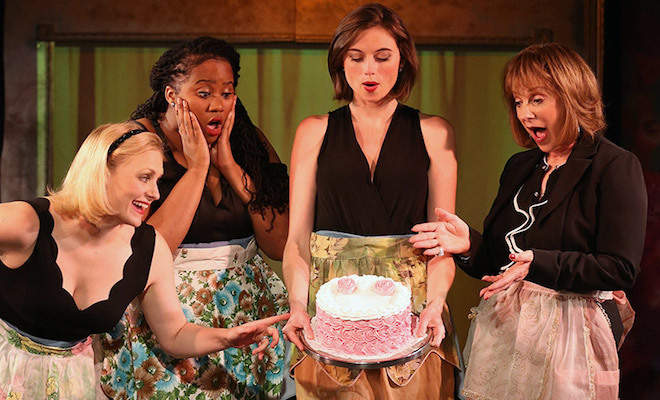 Scenic & lighting design for THIS ONE’S FOR THE GIRLS is by Josh Iacovelli, with costumes by Cynthia Nordstrom. Presented by William Franzblau, THIS ONE’S FOR THE GIRLS plays Fridays at 8 pm and Saturdays at 2 pm at St. Luke’s Theatre, 308 West 46 Street (just west of Eighth Ave.) Tickets are available through www.FortheGirlstheMusical.com or by calling 212-239-6200.